This version, DF 0.31.01, was released on April 1, 2010. The last update was v0.31.25, released on March 28, 2011. 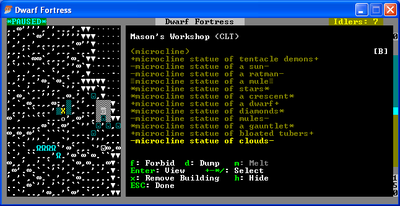 This page lists the changes in version 0.31 of Dwarf Fortress. The page links to currently existing pages which either have been or will need to be modified to list new details from this version. It also lists pages about entirely new subjects introduced in this version, such as burrows; articles created or completely changed based off of this version are marked in bold. Adapted from the google docs file by SirPenguin about the release. As with all major releases, version 0.31.01 broke save compatibility with old versions. The material system has been rewritten, and just about everything is made from a material now. It is now possible to track the identity of certain materials, such as blood spatter. The color of a base material will now have more effects - a wagon made out of featherwood will reflect the color of the wood. Material breath weapons are possible, and can be made of any material. These are mainly linked with poisons, and when inhaled by a creature, they will become poisoned. Small amounts of certain materials (blood, snow, etc.) can accumulate in a tile. For example, if enough liquid gold accumulates in a tile, it will cool into a glob of gold. This also works for materials such as liquid (molten) metal, which will cool into a glob which can then be used to melt down into a bar. see Material science for an explanation of what the yield/fracture/elasticity terminology means. Mechanisms can be constructed out of more than stone, and more materials are magma-safe, resulting in magma being easier to handle. Entity positions are now stored in the raw folders, allowing for custom positions through modding, as well as editing existing positions as you see fit. These include the new military positions (General/Lieutenant/Captain/Militia Commander/Militia Captain). Attributes have also moved into the raws, allowing you set all sorts of values such as how fast an attribute increases. Many objects - trees, plants, stones, etc. - now have material lists in the raws. Some raws have been merged, such as trees/plants, and stones/metals. A region's raw files are now stored in their respective save folder. Translucent tilesets are supported, using PNG. The DF window can be resized on the fly. The grid size is autogenerated on startup; such init.txt settings are ignored. Current desktop size is used for fullscreen size if fullscreen resolution is set to 0x0. You can bind multiple keys to one command. You can create keyboard macros. Input bindings are divided into sections. Lots of bugfixes and performance improvements. Arenas allow the player to set up battles with any kind of creatures with any type of equipment and have them face off. The Arena is accessed via the main menu screen. You can make as many creatures of any type a you want, equip them with any items you want, etc. You can also edit the layout of the arena by adding or removing water and magma and so on. An (incomplete) XML dump option of a world is now available. The file announcements.txt (at Dwarf Fortress/data/init/announcements.txt) can be used to control which announcements do or don't cause the game to recenter and/or pause. For example, you can make the game pause and recenter when ores and economic stones are uncovered, but not when ordinary stone like microcline is uncovered. The fortress guard is considered a squad under the sheriff, and the royal guard is considered a squad under the Hammerer. Captains can be appointed under your General and lead squads. There is a system in place that will try its best to keep your schedules staffed, going so far as finding replacements when soldiers get hungry/tired, as well as forcing soldiers to stay on duty if no replacements are found. You have complete control over how squads handle rations - food and drink stored in backpacks and flasks - and alcohol can now be stored as a drink option. Champions as heavily trained soldiers are no more. Rather, a single Champion is an appointed position that your duke/count/baron appoints. "Lord" soldiers aren't restricted in their weapon choice, and can be made into civilians again. Beds, racks, stands, boxes/chests and cabinets can now be assigned to squad positions. You can now use the note making system to lay out stations and patrol routes for your squads. Sparring has been redone. One such change is the addition of Combat Drills. A dwarf skilled in one skill can teach students via demonstrations of how to fight. This is set up in a classroom environment, so no actual sparring takes place (less dangerous). Even slightly skilled dwarves can teach people below them. There are also instructor monitored drill and sparring sessions. "They can currently teach weapon skills, wrestling, dodging, punching (grasp strikes), kicking (stance strikes), shield and armor use, yeah. They can also teach general close-quarters/ranged combat principles." Personalities play a role in these lessons. Naturally lazy dwarves will have a harder time learning and concentrating, though they can overcome them with skill/attribute increases. An instructor's personality is also taken into account, as a naturally reckless instructor is more willing to send green recruits into sparring sessions. Squad selection/orders now can occur in real time. The military menu has been entirely redone. You can issue orders to several squads at once or several individuals across different squads. Kill orders are now possible. You can select any creature your fort does not control to be killed. You can give squads nicknames if you wish. You can also give your barracks nicknames to help keep them separated. Prior to .31.09 a position called the Arsenal dwarf existed who handled various equipment delegation. Toady One has removed the position for the time being (.09 onward)to make the equipment handling run smoother, it will reappear in later releases but not until it has some better uses. You can now establish "uniforms" for your soldiers. With it, you can assign specific armor, weapons, and other such equipment that you want all soldiers in a squad to wear. This allows for you to establish either equipment protocols (I want this squad to carry a sword and a shield) or literal uniforms, such as all guards wearing dyed blue cloaks. Soldiers know the difference between training, battle, and civilian equipment, and when/how to switch between them, as well as how to store them, which is usually done in barracks via boxes (which can be assigned to squads). The above also extends to woodcutters/miners, who know how to properly retrieve/store their picks and axes. Equipment can be stored in squad boxes. You can now handle ammo allocation by material, so you can set aside metal bolts for battle and wooden bolts for training. Squads will maintain such ammo counts on their own. You can also handle ammo by type, so that you can have a squad that only uses bolts/arrows left over by invaders, etc. You have similar control over Hunter ammo. Training weapons are in now, made at the carpenter's shop. Due to the nature of the material rewrite, these weapons lack edges, making them far less dangerous. Dwarves can handle any weapons now (they are not limited to the 6 weapons allowed in previous versions). Critters now become familiar/accustomed to items they use often, such as armor and weapons. Being familiar with an item gives them better rolls during combat. They can also become attached to items and will refuse upgrades. Items keep track of creatures they kill now, and that will show up in the legends mode. Items can become "named" - raised to a semi-artifact level - if they have seen a lot of battles or have killed someone of a historical figure era-level of importance. Dwarves will now fill up their quivers properly - they will not go into combat with 1 bolt in their quiver if they can help it. You can assign specific items to units (useful for cases such as artifacts). Dwarves assigned to squads will go train in their free time if they have self-discipline. This includes individual drilling practice. 1/3 of dwarves have a "favored" weapon. The new combat reports. Note the date, ability to zoom to an announcement's location, and more flavorful descriptions. All weapons now have multiple attack types (a sword can use a thrusting attack, or with the blade itself, or even the pommel) and each attack can do a different type of damage. Armor skill and quality of the armor increases your "deflection" roll, which alters the effective force of an attack. Weapons don't use hard-coded percentage damage anymore, but rather, use their material's various properties in order to determine damage. The swing velocity of a hammer is determined by the strength and weight of the hammer itself, among other things. Woven/Chain items have a "structural elasticity" property (compared to plate/scale). Combat has been entirely rebalanced due to the new material and body changes. Small creatures are now able to take on larger creatures by pecking away at their bodies, something which was impossible in the old version. Thanks to the material rewrite, though, a well armored knight will fare without many problems against 20 groundhogs. Multiple small attacks will have a cumulative effect. "I had a dragon fight some lions, and after a little bit of dragonfire and close combat, I ended up with a dragon covered with the grammatically-in-progress "lion melted fat spatter"." Attacks take into account the position and relative nature of the body. Attacks won't "loopity-loop" through the body. Temperature transfer between wrestlers is now possible, so think twice before wrestling that spirit of fire. Ranged damage has been nerfed, in addition to bolts making "logical" paths now. The firing rate remains the same. There's now a notion of a "squared shot", in that your attack could hit someone's arm full force, but if you didn't hit in in the right area, the bone would not break. This helps many problems, such as with bolts, as well as axes/swords not lopping everything off every time you swing. Twisting your weapon in a wound has been balanced, and won't just amplify damage forever. Toady on the path of the force of an attack: "The armor is all checked in order from outer to inner, then it gets at the tissue layers, altering the character of the attack as it goes." Attacks can pass through a wound sufficiently large enough. Force from blunt weapons can transcend layers. For instance, a hammer can bruise the skin while breaking the bone underneath. As such, plate armor's benefits are generally ignored by blunt attacks, and leather armor would prove to be more effective. "Solid breath can take the form of a forward moving dust puff that accidentally knocks people out due to some cave-in code. When I fix that, KOs may or may not be a parameter. Solid breath can also take the form of a solid glob (a small one right now) that is hurled like a stone. It might as well be a thrown stone of the solid. Solid breath can also be an undirected dust puff (also accidental knockouts)." endurance - this'll take some of the weight off of toughness and control your exertion. recuperation - somebody suggested "resilience". i don't really like any of the names... in any case, this will control the healing of your physical wounds. disease resistance - the more time i spend on infection and venom, the more this will matter for this release. there will also likely be a notion of specific immunities, some of which you could gain with exposure or whatever ends up making the most sense. analytical ability - thinky stuff. creativity - being able to make up neat stuff. intuition - being able to get stuff. focus - being able to get into stuff. willpower - being able to keep on with and cope with stuff. patience - being able to handle not doing stuff. spatial sense - sense of surrounding stuff. kinesthetic sense - sense of own stuff. linguistic ability - all of the wordsy stuff. empathy - being able to feel other peoples' stuff. social awareness - being able to manage and handle social stuff. Creatures now have souls, and these souls serve as storage for a creature's mental attributes and skills. Creatures can have multiple souls, though there is no such use in the current version. Attributes and skills can now "rust" if the attribute/skill is unused for a long period of time. The more rust the skill or attribute has, the less effective it is, and high enough rust will actually "delevel" the ability. Rust can be worked off by simply using the attribute or skill in question. Attribute/skill display system has been redone so as to not overwhelm the player. Skills have been split up into logical groups to make assigning skills easier. Creatures now have a "situational awareness" skill, which handles a creature's ability to deal with surprise attacks and ambushes. Attributes and rust rates are linked to specific castes, so you could have brutes intermixed with brainy creatures of a single race. "Ceilings of attributes are a percentage of the starting value. So a strength 1000 dwarf might attain 2000, and a strength 750 dwarf might attain 1500." Creatures are now unique to each other with different appearances, including hair color, facial features, etc. These are visible in adventurer mode as well. Different color patterns are also available, like striped or mottled. Creatures can also be fatter/taller/etc. than usual. This affects their size. Fatter creatures can last without food longer. Creatures have a metabolism now, which deals with how fast they heal and how fast they burn fat. Fat creatures also move slower. The trimming of hair/nails is also possible for civilized creatures, and they will grow long and unkempt without such activities. Creatures inherit appearances from their parents. This includes dominant/recessive genes. As one example, you can use this system to breed your dogs to a certain color/size. Layer trimming/caring uses style definitions from a culture. Some cultures may grow beards, others may shave them. Prisoners, etc. may be forced to adopt these new styles. Speaking of beards, as if it wasn't obvious by now, but this means dwarves finally have beards! On a more startling note - so do elves! Creatures can now be part of a caste, and this may govern many things, such as their profession, appearance, etc. Hair grows and eventually grays over time. It can be trimmed, and if left alone it will become shaggy and unkempt. Body parts and tissue layers can be made out of any material you want, such as for logical creatures like Iron Men, and illogical abominations like Dwarf Lung Men. It's now possible for some creatures to be made out of solid material, such as Iron Men, who are much harder to fight. You can also have hollow body parts, perhaps filled with air or other materials. Some layers can serve as protection, such as chitin layers. Bone layers also protect organs, such as the skull protecting the brain. Creatures also now have tendons and ligaments, and are made from the "sinew" material. Creatures store energy from their food, getting fatter and more muscular. Fat affects such things as insulation, speed, etc. Strength also increases muscle size. Both have an effect on a creature's total size. Guts are realistically colored - crazy stuff! It is now possible to "flay" a creature. Have fun! We've also got water freezing into frosty stuffs on people if they get wet and then step out into the cold, and steam coming off of spirits of fire in the rain. Skeletal critters now have their bones held together by rotted ligaments. "Thoughts" of a dwarf have been redone. The new screen includes their current thoughts, age/birthday, physical description paragraph, a description of their attributes, their likes/dislikes, and their mannerisms. Also included are descriptions for their wounds/scars. 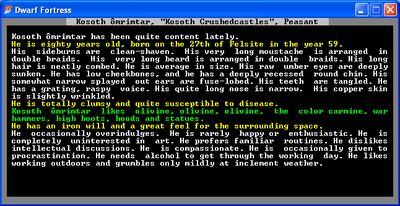 A dwarf's birthday and age are stored in their profile now. Dwarves now have mannerisms, such as "always scratches his head when he's trying to remember something", "laughs at his own jokes" or "talks to herself whenever she's bored". There are 65 types with 3-5 situation qualifiers. Burrows! Burrows are areas in your fort where dwarves live and work in. You can assign these areas like zones and assign dwarves to them. 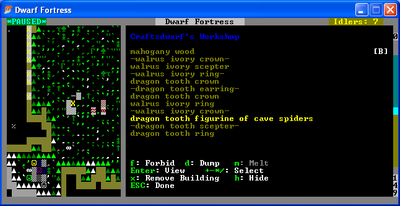 Dwarves will only use workshops, rooms, etc. in burrows they are assigned to. There are a significant number of ways to utilize burrows, from restricting certain mining expeditions to skilled dwarves, to making noble districts, to setting "emergency" zones for civilians to flee to, etc. You can set soldiers so that they defend certain burrows. If an enemy enters a burrow they know enough to stop what they're doing and head towards it to defend it. You may choose and appoint someone as your baron when you reach barony status. You can elect not to have one as well. Dwarves won't immediately drop everything if they find themselves hungry or tired, and will try to finish their current job first. There's a difference between sleeping barracks (known as a Dormitory) and squad barracks. Liaisons will be generated from scratch if they die. Statues now have art associated with them. Some new crafts you can make. Statues and figurines now have art associated with them. "Statues of specific dwarves get the dwarf's name right in the item name." Custom workshops are now able to be modded in, allowing you to set up custom reactions. These can support corpse harvested items, like shells/horns, and might use barrels/other containers. You can now make crafts out of horn, ivory, teeth, and other new body parts. These include dragon tooth rings and ivory crowns. Butchery has been overhauled due to the new body part systems, with creatures yielding many more parts for consumption. It is now possible to have automated fishing cleaning and fat rendering. The alert statuses (i.e., "Stay Indoors") has been entirely redone. You may set several custom alerts with a user defined behavior. For instance, you could set a "Underground Attack" alert where you force soldiers to equip melee weapons and head to a predefined location. These alerts can also be assigned to civilians, such as telling them to flee to the great hall. The Alerts system is also a part of how you get your Dwarves to Train (the new way to Spar). Combat reports have been redone in hopes of consolidating sentences and making it more interesting to read. Combat reports are separated into combat, sparring, and hunting reports. You'll see a notification on the side of the screen letting you know a combat report has been generated. You can choose different options for each announcement, like whether you want it to pause the game or recenter your view. Caravans can now bring sand and glass! Also flasks, waterskins, quivers and backpacks. But wagons are gone, for the time being. Everything is carried by pack animals. The new wound coloring system. Hospitals are used like zones. Items used within these zones (beds, tables, boxes) allow for hospital use. They also use a new item, called a traction bench. Doctors can "prescribe" treatment, such as bed rest, using splints for broken bones, amputation for infected limbs, and surgery. Doctors will set bones for simple fractures, use traction for difficult overlapping fractures and use surgery for disgusting compound fractures. They also excise rotting tissue and amputate limbs too rotted off to save. The system where dwarves heal on the season change is gone. Wounds are dressed with bandages, which speeds healing and slows bleeding. Sutures make wounds heal faster. Sutures can be ripped out in combat, causing pain/bleeding. Crutches are now in the game, allowing one legged dwarves/injured people to walk normally (as opposed to crawl). They will move faster as they get comfortable with their new crutch. Creatures can now clean the filth they acquire due to various materials, like mud, blood, vomit, etc. As such, soap has a use now, which deserves its own bullet point. You can appoint a "Chief medical dwarf" to handle the various medical information, which requires the "Diagnosis" skill. What type of various medical information? "unit wounds/status/required treatments/medical history, etc." - Think of it like the bookkeeper. Dwarves are more proactive in saving wounded people, and will do what they can in regards to bleeding on the way to the hospital. Patients can use soap/water to clean wounds and grime to reduce infections. Sutures, casts, etc. will reduce infection as well. All cloth and thread items have associated lengths/areas now. Threads are use for sutures (thus, one "thread" item could be used for multiple sutures) and cloth is used for bandages. Items in this way aren't split (a la coins or bolts), but rather, they're consumed in pieces. Unskilled or apprentice doctors can make mistakes when treating a patient or doing surgery. "Healthcare" as a skill is gone. It's been replaced by 7 new labor settings, 5 unit types, and 6 new skills. There are different type of doctors associated with the skills. Dressing wounds, diagnosis, surgery, setting bones, suturing and walking with crutches appear to be the new skills. The current 15HP-per-body-part system has been dropped in favor of individual wound tracking. The above also allows for scars. Open wounds can get simple infections, which results in oozing pus, slow healing, and can even kill. Rotting wounds smell and contribute to infection levels, as does grime buildup. Tissue layers can boil off when exposed to extreme heat. You can damage a creature's motor and sensitivity nerves. Motor damage prevents that part from working, and sensory nerve damage makes you lose feeling in that body part. Partial and compound fractures are now possible. Fractured bone can be knocked inwards to cause damage to organs, like forcing a jagged piece of skull into the brain. Bones can also pierce layers, like having bone sticking out of your skin. Guts are under pressure and can pop out of a wound. Injured creatures can continue to work if they are treated. A miner who breaks his left hand will go back to mining with his right hand (after his broken hand is set in a cast). "There are lots of wounds that won't heal now if they aren't treated (aside from the nerve stuff, the three kinds of bad breaks won't heal if not treated), and infected wounds heal very slowly." Types of poison effects: pain, swelling, oozing wounds, bruising, blisters, numbness, paralysis, fever, bleeding, coughing/vomiting blood, nausea, vomiting, unconsciousness, necrosis, impaired vision, drowsiness, and dizziness. Poisons can be contacted, injected, or inhaled. You can be immune to poisons; creatures seem immune to their own poisons. Severs transfer containment, so that a ripped off venom fang from a Giant Cave Spider will remain venomous. As of now you cannot use it as a weapon. Underground layers have been entirely revamped, allowing for more diverse underground with new creatures, features, and other interesting goodies, such as Mushroom Forests. The standard amount of layers (around 15) has been scrapped and increased dramatically; upwards of 50-100 layers. Each cave layer region (which is a certain depth and portion of the world map) has its own name, animal populations, civilizations, etc. They also show up on the legends screen. Caverns now exist underground. Caverns are open areas underneath the earth, and are home to creatures, underground lakes, and other interesting features. Features are much more easy to discover, and almost every site is guaranteed to have SOMETHING interesting in it. For instance, magma is almost always guaranteed to be near the very bottom layer (ex:-150z tiles). Features can span multiple world tiles, and can be explored via adventure mode and dwarf fortress mode. You can use world gen parameters to get rid of underground features. The default settings are set for cavernous so you're guaranteed to find cool stuff. Features are not instantly revealed anymore. Underground areas must be explored by dwarves prior to revealing features. So yeah, the new system is to have a 60 or so tile flood out from your dwarves as they go underground, and any time they get within 30 tiles of the 60 tile flood (flags are kept when the flood got out to 30, roughly), it'll flood out again, picking up those flags and placing new ones, so it moves out in a kind of chunky way. Squads can't take orders to walk into hidden zones (must reveal first). It's possible for an adventurer to enter a massive underground cavern on one side of the world and journey all the way to the other. Chasms as they were in 40d are gone for the time being, replaced by finite caverns. Underground animal-people can use crude weapons and mounts now. Batmen could ride giant bats and shoot poison darts at you with makeshift blowguns made from giant cave spider legs - whoa! Their goal is to cause as much havoc as they can before sneaking back home. Underground critters are "drawn" from a large population that is off site. They will replenish their population so long as a cavern has an open "edge" allowing them to spawn in. The above, coupled with other changes, allows for the possibility of never-ending attacks. Antmen now have creature castes which separate them, including queens. There are also antmen nests to worry about. Gremlins are back. These sneaky dudes are invisible until spotted, and will step on pressure plates, pull levers, and open cages. There are many new (toadyOne mentioned around 40) underground critters. Random creatures are just that - random. The can have unique attacks, like firebreath or poison, as well as a random number of body modifiers like legs, wings, etc. Some examples: a ribbon worm with wings made of stretched skin. An eyeless antenna lizard. A glob of vomit inside a round shell. They pull from certain base types (blob, quadruped, humanoid) as well as various animal/creature features. The old HFS that we know of is gone, replaced by a larger area that is both hard to get to and present on every map. The specific critters of the old HFS did not survive version change and have been replaced with procedurally-generated beasties in greater numbers and strength. A secondary feature of the new HFS is the rarer curious structure, of which there are one per map tile (as frequent as the old HFS). There is now the notion of a split leadership. Some leaders may prefer to be "traditional" rulers, hanging back in their cities while appointing generals to command their armies. Others may prefer to lead battles and wars themselves. Goblin society is more violent than ever. They respect those with power, and demons will be forced to kill for their loyalty. Other goblins, however, can do the same. Goblins obtain their structure over the course of world generation. For instance, demons are not hard-coded as leaders, and must earn their position. Forgotten beasts can escape from the underground and try and pass themselves off as deities, gaining worshipers and taking control of civilizations. Leaders of civilizations can now own "pets", meaning they can tame wild animals and use them in war. Giant eagles, tigers, everything is fair game. Elves have a great advantage here for obvious reasons, but dwarves will be able to make use of underground beasts. "I've added the ability to specify in the world gen parameters the number of sky z-levels, the number of z-levels minimum between each layer (it'll often be more because of elevation changes), and the number of extra z-levels down at the bottom." Much of the map feature code was rewritten to be more flexible in future expansions and updates. Megabeasts aren't pushovers in worldgen anymore, and have been toughed up a bit too much (bug). Don't expect to leave the Age of Myth. Titans in good areas will be benign/neutral to creatures. Please add bugs to Known bugs and issues. Please do not add them to this page. This page was last modified on 29 August 2018, at 10:53.